EL Diablo, the newest, latest, burger creation from the corporate folks of Carl's Jr will grab your attention. The research and development department must have a lot of fun thinking up this wacky burger combination. 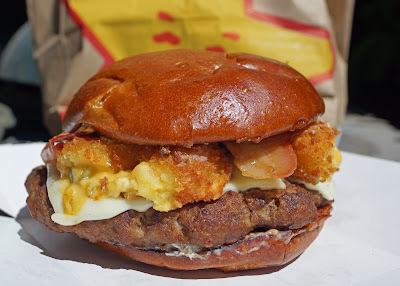 Do they have a cosmic connection to the inner cravings of my mind because this burger may have been created just for me. Are you ready for the ingredient list? You have a choice of 1/2 or 1/3 pound beef patty. It is topped by several strips of bacon, pepper jack cheese, fresh sliced jalapenos, habanero sauce and drum roll please; jalapeno poppers. This is all held together by a freshly baked roll. I went to the drive through window and gave the clerk $7.22 for the 1/2 pound version. Once home I unwrapped the burger immediately to reveal a troubling red flag. A jalapeno popper looked like somebody had taken a bite out of it and place it back on the burger. I removed it. A bite was taken of this devilish creation. The roll was fresh, soft and tasty. The hamburger was a little dry but is not all fast food burgers that way?. There was a pronounced jalapeno component from the fresh sliced jalapenos. This was a welcome and satisfying flavor to me. I did not even notice the habanero sauce and did not even know of its presence until I read press about this burger. The jalapeno poppers were good with there fried goodness. The bacon was a little limp but was real with bacon flavor love. The pepper jack cheese was silent with blandness. The verdict? This burger will receive a passing grade of C for average but an A for creativity. This burger was not hot as promised. It was pleasantly mild with jalapeno flavor. I thought the jalapeno poppers was a little overkill for this burger. I did contact Carl's Jr. about the popper with the bite. They replied with an apology with no explanation and coupons for another day. I will not purchase another El Diablo but had fun giving this one a try. That is disappointing. I am not a big pepper fan but I have found a chain place that makes a great burger, reasonably priced. They also have a bar with several types of peppers for your enjoyment! Habit Burger. Greg, We will have to give Habit Burger a try. I hope they have a bacon burger. I'd try one of those. Perhaps the pepper jack was overwhelmed by the jalapeño?